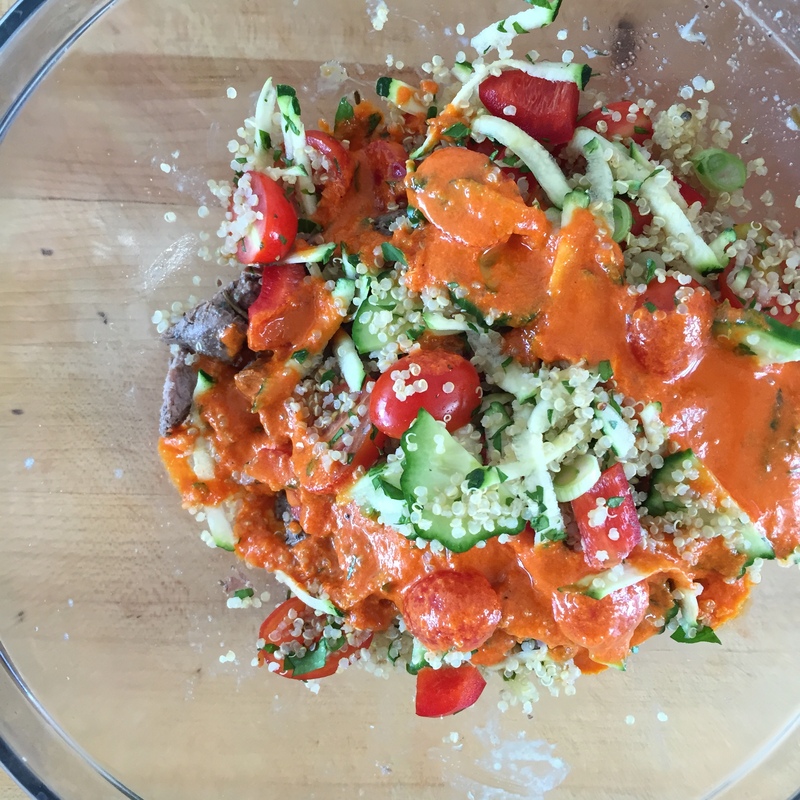 A colorful quinoa recipe for my plant-based friends! I generally don’t eat quinoa, but I do have some vegan/vegetarian skills up my sleeve. I also occasionally receive requests from clients to prepare quinoa or rice dishes. I felt inspired to share a vegan-friendly dish in light of this week’s book release from Rich Roll and Julie Piatt, The Plant Power Way. I have tremendous respect for these two wellness advocates and am generally in alignment with their message of healthy living through whole, real foods. I’m not going to address the eternal, “is this paleo?” debate that tends to circulate around items like quinoa (Is it a seed? Is it a grain? Is it the spawn of the devil, himself?). My general feelings on the subject are this… Try removing it from your diet for a week or two, then add it back in slowly. See how you feel. Pay attention to any differences. If you tend to have reactions to grains, legumes, or even nuts and seeds then quinoa probably isn’t the right choice for you. For those who like quinoa and have no issues, eat it occasionally and try to maintain a good variety of foods in your diet. This salad is great with or without meat added. I like it with a little grilled lamb that’s been marinated and chopped small like the rest of the vegetables. And the sauce takes the flavor of this dish to awesome levels. optional: add grilled, chopped lamb or chicken marinated in lots of lemon, olive oil, salt pepper, red onion, and a bit of balsamic vinegar. For my plant-based buddies, you could also achieve a similar effect with portobello mushrooms. Chop all vegetables and add into the same bowl. Add quinoa and toss until mixed evenly. Add sauce and toss to coat. Season with salt or pepper as needed. Serve in lettuce cups, by itself, or over a bed of greens.